The loss of a permanent tooth can be troubling for patients, making it hard to socialize confidently or chew food. If one or more teeth in your smile were extracted due to trauma and decay or were knocked-out during a physical injury, dental implants provide an ideal solution. Unlike removable dentures and partials, or even bridges, implants nurture strong smiles and support natural aesthetics. 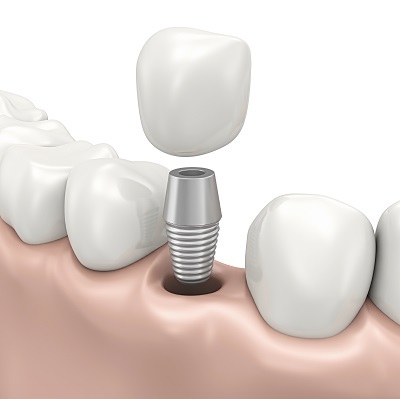 For reliable and lasting teeth replacement, contact Metrowest Family Dentistry for dental implants in Southwest Florida. We welcome patients into our office for comprehensive consultations that determine whether they qualify for dental implants. Patients should be in good overall physical health and have stable gum tissue to support best results. Our implant dentist, Dr. Alan Heap, works with a qualified local surgeon – just 10 minutes away from our office -- for the dental surgery component of your treatment plan. After implant posts have been added to your jaw structure, they naturally integrate with the bone to become a strong support for later prosthetics. All on 4 – This innovative method of smile restoration was developed by Nobel Biocare. Patients missing a full row of teeth in the upper or lower arch benefit from permanent, non-removable full-arch bridges. These are held in place with a few as four implant posts. For many, bone grafts are not necessary as pre-treatment. Over Dentures – These affordable implant-supported restorations are affixed with just two dental implants and special attachments. Your denture snaps on and off permanently rooted implant posts for a combination of conservative care and stabilized teeth. Hybrid Dentures – If you’re interested in a completely secured full denture, Dr. Heap provides hybrid denture prosthetics. Your new teeth are permanently retained by a many as eight dental implants, providing the ultimate in dental function and natural feel. Mini Implants – These small sized versions of traditional implants are ideal for patients who have experienced bone loss and want to avoid a graft. Mini implants are smaller in diameter and integrate into areas of depleted bone. These are typically used to replace front teeth or to stabilize a denture. Emergency Implants – In cases of injury or accidents, tooth loss is unexpected and requires immediate care. When treating emergency patients, Dr. Heap coordinates same-day care with his oral surgeon to have your smile restored. Even if your tooth was severely dislodged or has been infected and cannot be saved, we can provide immediate extraction and replacement. Visit our Implant Dentist Today! Dr. Heap has over 15 years of experiencing restoring implants and helping patients enjoy an improved quality of life. He is also skilled in the use of popular implant brands, include Nobel and Straumann ProArch. To schedule your smile restoration appointment, contact Metrowest Family Dentistry.